Please note that this is not the link-up post for the discussion of The Scarlet Letter for the Reading to Know Book Club. The link-up post will go live tomorrow, so stay tuned! What follows are my personal thoughts on the book. Such as they are. Just like many of you, I read The Scarlet Letter for the first time in high school. And, like many of you, I didn't care for it then. I believe I understood it, I just didn't like it. Who wanted to read about a girl shunned for life because of one mistake that she made? I was curious to re-read it as an adult and see what I thought of it now that I'm older, wiser, etc. Ha. I still didn't really care for the read but I found it a lot more entertaining than I did way back when in that the characters came across as more "full" than they did to me as a younger reader. I could appreciate their conflicts and struggles a little bit more, I guess I should say. I'm still pleased that the book isn't any longer than it is because it's not so entertaining that I found myself wanting to spend a lot of time with it. I am grateful for the quick read which also allowed me to finish the book the last week of January. I decided not to write my thoughts out right after reading it and now I wish I would have because I feel a bit rushed and pressed to say something brilliant. Truly, I have nothing brilliant to say. 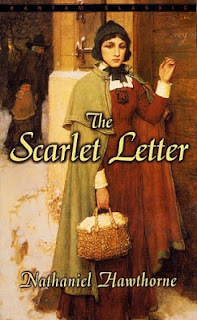 The Scarlet Letter tells the story of Hester Prynne who gives birth to a daughter after having an adulterous affair with an unidentified male. The story is set in a Puritan village between the years 1642 and 1649. Hester is shunned due to her sin and is forced to wear a letter "A" on her bosom as a mark of her sin. She refuses to reveal the identity of the father and the reader is left to wonder over that bit of information for a time. However, the girl's father is soon revealed and we are allowed to see what his secret sin has done to his spiritual, mental and physical health. Hester suffers publicly while her lover suffers privately and their emotions and positions are explored in the story. I do not think that it would hurt for young folks today to think through the consequences of their actions, much as Hester was forced to do courtesy of the times in which she lived. True, mistakes will be made. Grace exists for such mistakes and we can be grateful for that today and always. Today's Christian society seems to do more in the way of aiding sin (by failing to provide faithful Biblical instruction in the first place) so that grace may abound, instead of encouraging Christians to avoid sin at all costs in the first place and explaining the reasons why. When any sin is committed at any period in time (1650 or 2013) it should be acknowledged and confessed. And then after that has been honestly done, grace should be extended to the sinner. Sometimes that grace means giving money to a recovering alcoholic to help provide for their basic needs. Sometimes that means providing food and clothes to an unmarried mother. Sometimes that means giving a job to a teenager who needs to earn money to pay for an item they damaged. Sometimes it means having dinner and spending time with someone who has grievously wounded you, physically or emotionally. Grace exists and we should be ashamed if we ever ignore it. Do I like the way that the Puritan villagers handled the sin of Hester Pyrnne? Well, yes and no. Yes, because she didn't confess and repent of her sins. Instead she was rather defiant, spending time crafting a very elegant "A" to wear because she was thumbing her nose at those who required her to wear it. She had a haughty attitude and thought herself better than anyone and everyone else. The leaders in the community there would do right to wonder if they saw true repentance and to encourage people to avoid tight fellowship with her if they were unsure as to what her morals and beliefs are and she refused to speak with them about such matters. I didn't see repentance in her except when she discovered it was very hard to raise a child, especially alone. And in that case, she was too prideful to admit that to anyone and/or ask for help which she clearly could have done. Still, over time, the leaders began to realize that she meant the community no harm, went out of her way to do good, and started lifting "regulations" against her including the removal of the letter from her chest. And they never prevented her from fellowshipping with others, truly. They did, however, teach others that her behavior and attitude were in error and their teaching had natural consequences. The sin of anyone should give us pause and Proverbs is clear about choosing one's friends wisely. At the same time, I don't like the behavior of the leaders because they didn't seem to bother coming to her directly to ask if she would talk with them further about her affair. They didn't come to her to find out if they could help somehow in raising the child. They offered her no visible signs of grace and so she believed there was none to be had. When you have sinned it is very hard to believe that grace is available to you. One's faith can falter after a serious misstep. A healthy Body of Christ (i.e., the local church) should be quick to come to the side of a Christian whose sin has been exposed and preach the Gospel of Christ to them: repent and confess the sin, and God has said He will be faithful and just to forgive us that sin and to cleanse us from all unrighteousness. He can see us through the lens of Jesus's death on the cross and sometimes that's a hard thing for we humans to believe. (Even though it is something that we are encouraged and required to believe!) The community leaders should have come alongside her and said these things to encourage health and healing and in an attempt to restore her to the Body of Christ. In some ways, the entire book seems like a lose-lose situation. There is a moral standoff between Hester and the town leaders. They await repentance. She refuses to give it. They try to deal with the situation of what is by all accounts a hard and prideful heart and she guards her emotions, trusting no one. She is misunderstood and so are they. It's kind of depressing in a way. It is, in some ways, a very curious read. I think, on the whole, I'm very glad to have read it again. I'm also very glad to be done with it again. And that sums up my thoughts on the matter at present. Looking forward to hearing what other people have to say about this book! An English-teacher real-life friend of mine shared in the comments on my review that one of Hawthorne's ancestors was a judge during the Salem witch trials, and that colored his views on the Puritans plus embarrassed him, so he portrayed them as harsh for his plot purposes. I agree with pretty much everything you say here. I can't say I "enjoyed" the book per se, but I am glad I reread it. I got much more out of the psychological drama and contrasts this time between Hester, her lover, and Chillingworth. Agree with you. Didn't truly enjoy, but glad to have read it. And my own thoughts weren't as deep as yours! I feel like The Scarlet Letter is perhaps the most sad and depressing book I've read, but at the same time I am glad I read it because it gave me a lot to think about. "I thought I had read this book in high school or college. I remembered bits of it, but I really don't think I actually read it all until now. I remember disliking the preacher, Arthur Dimmesdale, thinking he was a jerk and a hypocrite, letting Hester take all the blame, and getting off scot-free, but that wasn't actually the case at all. He suffered, too, knowing that he was guilty. He suffered a disease of the heart, and was physically, spiritually, and perhaps even a little mentally ill. He and Hester loved each other throughout the span of the story, seven years. (more than seven years, because Pearl was a babe in arms when the story began, so there was about a year from her conception at that time.) They never stopped loving each other, although I fail to see what she saw in him. Rather than the arrogant jerk that I thought I remembered, Mr. Dimmesdale was morally and physically weak, sickly, and pitiful. He clung to Hester, depending on her strength. Hester, on the other hand, was the epitome of quiet dignity. She bore her shame openly, but humbly served the community that shunned her by attending their bedsides when they were sick and dying, and by the lovely garments she sewed and embroidered. She made everything from baptismal gowns to official robes of office and ceremony, to burial shrouds -- everything except wedding gowns. She lived her life alone, with no one but little Pearl for company. Pearl was a free-spirited child, full of energy and wise beyond her years. She asked her mother some very pointed questions concerning the frail and sickly pastor, which made Hester very uncomfortable. It puzzled me that, though this was supposed to be a Christian community, there was so little Christ-centered love and forgiveness evident. Hester's and Arthur's story was all about guilt and punishment, but forgiveness was lacking. A strange book, short but not easy to plow through, with all the old-fashioned discourses and language." I love Fancyhorse's take on this - and generally agree with her. The one issue I take with Carrie, is that I do not think a "confession" or "repentance" would have made the slightest bit of difference to the Puritan community. Hester's fate was already set. What they wanted was for her to name her love so that they could punish him as well. There is nothing in the book (or in history for that matter) that would indicate that Hester would have received any benefit from a show of "repentance." The history of the Puritans rather shows that they were ruthless in punishing those that disagreed with them, and that their reign in New England came to an end only after the Salem Witch Trials caused a complete reconsideration of their philosophy - and a rejection of their theocratic goals. I'm not saying that they were all bad. Nobody is. But their rule over New England was characterized by intolerance of dissent - even on small issues, the expulsion of dissidents, and the eventual slaughter of innocent women. Not much of a legacy to celebrate, I'm afraid. I got more than a little thrilled that I was quoted here, I have to admit. Posting my review soon! I think that we found a lot of things in common in this one, Carrie. Overall rather depressing, I agree. As to the discussion regarding the Puritans--fascinating! It seems there was division within their camp as there all too often is. I'm studying government with my teens and we are learning some very intereting things about the different philosophies of the Puritans, particularly regarding the "Creator/Redeemer" distinction and how some colonies set up governments acknowledging God as Creator but leaving each individual freedom in their perception of Him as Redeemer while others (including Massachusetts) tried to dictate individual relationships with God the Redeemer. I probably didn't summarize that very well, but it is interesting to consider there initial governing documents in light of their later history. Great thoughts and worth pondering! The Puritans have LONG been a controversial "people" but I still maintain that there is quite a bit of good in their teaching and things to take away from them. Furthermore, they provided valuable writings and resources for Christians, specifically. John Bunyan was a Puritan and his writings are touted as being Christian classics that every Christian ought to read. Matthew Henry was a Puritan and his commentaries are widely regarding as being worthy of use. Two examples to point out that just because someone was a Puritan doesn't make them "bad" by nature or have a legacy that should not be celebrated. Christians in general are assumed by the world at large not to have a legacy worth celebrating and I disagree with them. I can see why they say it - from their perspective - but it doesn't make it true. Every age has its own theologians who rose to prominence and their writings have to be sifted and sorted through. They have to be viewed from the lens of history (i.e., where they were in it) along with many other factors. Every age will have some winners and losers, as I do believe we agree but when there isn't cause to reject a people outright (and I don't believe there is in this case) then I think we ought to take care not to do it. Puritans have offered the world some beneficial writings which are still worth looking at today - and not because they are bad writings but because they are good.